SCRUBTEC R 6 is a new generation of scrubber-dryers, delivering cost-effective, sustainable performance while maintaining the highest expectations for your clean floors! SCRUBTEC R 6 is particularly suitable for the following application: industry, warehouses, repair shops and transport centers. Large 120 litres solution and recovery tanks allow more than 1 1/2 hour of continuos scrubbing without a dump and refill, while high down pressure (up to 96 kg on disc versions) allow for one pass efficient cleaning. Solution sight tube indicates how much clean water remains in the tanks. Featuring an open machine design, the operator can access the SCRUBTEC R 6 driver compartment from the left or right and quickly modify the tool-free adjustable seat for maximum comfort. 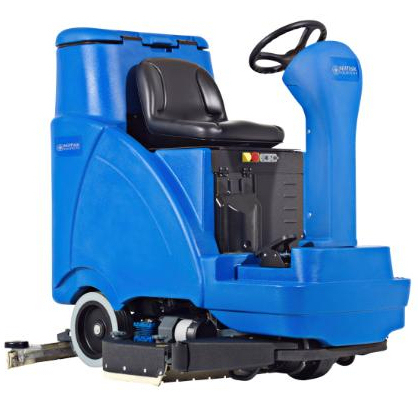 Offering best-in-class maneuverability and water pick-up, the SCRUBTEC R 6's turning radious is ideal for cleaning in tight spaces, while its heavy-duty, fully adjustable, steel side skirts provide enhanced wiping and water containment. Large opening to the recovery tank allows for easy cleaning and tank access. Debris tray allows to prevent bulkier debris entering into the recovery tank.